American Warlords is the story of the greatest “team of rivals” since the days of Lincoln. In a lifetime shaped by politics, President Franklin D. Roosevelt proved himself a master manipulator of Congress, the press, and the public. But when war in Europe and Asia threatened America’s shores, FDR found himself in a world turned upside down, where his friends became his foes, his enemies his allies. To help wage democracy’s first “total war,” he turned to one of history’s most remarkable triumvirates. Henry Stimson, an old-money Republican from Long Island, rallied to FDR’s banner to lead the Army as Secretary of War, and championed innovative weapons that shape our world today. General George C. Marshall argued with Roosevelt over grand strategy, but he built the world’s greatest war machine and willingly sacrificed his dream of leading the invasion of Europe that made his protégé, Dwight Eisenhower, a legend. Admiral Ernest J. King, a hard-drinking, irascible fighter who “destroyed” Pearl Harbor in a prewar naval exercise, understood how to fight Japan, but he also battled the Army, the Air Force, Douglas MacArthur, and his British allies as they moved armies and fleets across the globe. These commanders threw off sparks whenever they clashed: Generals against politicians, Army versus Navy. But those sparks lit the fire of victory. During four years of bitter warfare, FDR’s lieutenants learned to set aside deep personal, political, and professional differences and pull a nation through the twentieth century's darkest days. Encircling Roosevelt’s warlords—and sometimes bitterly at odds with them—was a colorful cast of the Second World War’s giants: Winston Churchill, MacArthur, Josef Stalin, Eisenhower, Eleanor Roosevelt, and Charles de Gaulle. These and other larger-than-life figures enrich a sweeping story of an era brimming with steel, fire, and blood. 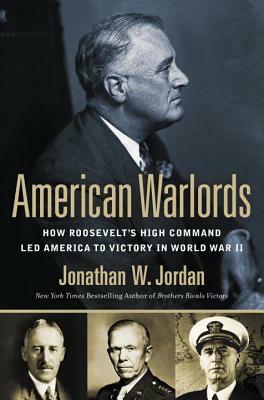 Drawing upon a wealth of primary sources, American Warlords goes behind closed doors to give readers an intimate, often surprising view of titans who led America from isolation to the summit of global power. Written in a robust, engaging style, author Jonathan W. Jordan offers a vivid portrait of four extraordinary Americans in the eye of war’s hurricane. Jonathan W. Jordan is the author of the New York Times bestselling Brothers Rivals Victors and the award-winning Lone Star Navy. A practicing attorney in Atlanta, he lives in Marietta, Georgia.